Today’s post is pink and white and sparkling all over! 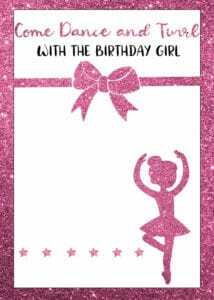 We are continuing our Ballerina party theme from last week with these super sparkly Ballerina Birthday Invitations. 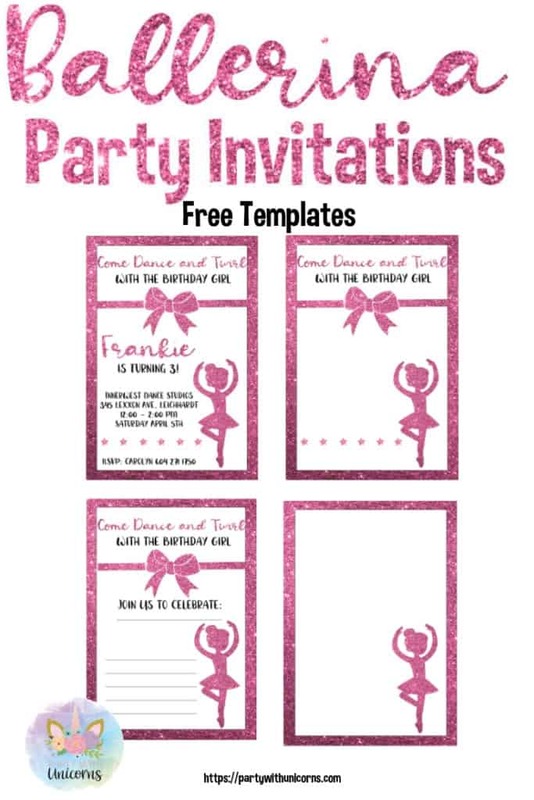 These invitations use the same clip art from our Ballerina Party Printables post and our recent Ballerina party favor boxes. These invitations have been made using fonts from Creative Fabrica. 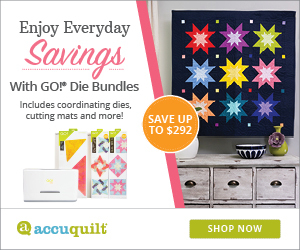 I am a Creative Fabrica seller and affiliate. If you are not familiar with Creative Fabrica, I definitely recommend that you check it out. 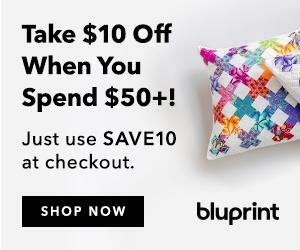 It is a great resource of graphics and fonts. Creative Fabrica offers new free graphics every week, you can click here to get find this week’s freebies. The pink “Come Twirl with the Birthday Girl” is written in the Whaley Fun font. The black writing in the sample invitation is Bright Confetti. For today’s invitation, I’m making four different printable options available for you to download. If you need some instructions on how to edit the invitations, check out my recent post on how to customize invitations online. I have provided instructions in that post on how to edit the invitations with Canva, which is free. If you do not want to use Canva, you can simply load the invitation as an image in Microsoft Word an add a text box over the top to add your details. 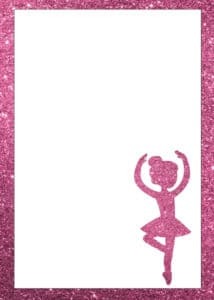 The second Ballerina invitation template has the heading, pink bow but no starts. 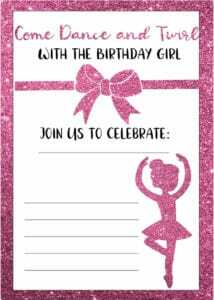 The third Ballerina invitation template is blank, so you can customize any which way you like. has the heading, pink bow but no starts. 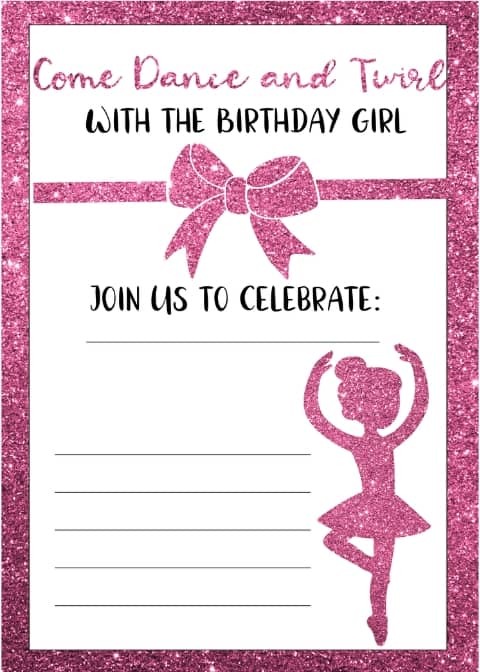 The fourth Ballerina invitation template is blank with lines. You can print this one on your home computer and write in all of the details with a pen. This template is set up with four invitations on an A4 piece of paper. To download the Ballerina templates, simply join our mailing list below. Once you enter your email details the sign up box will disappear and the links to the invitations will be available in the same location as the sign up box. Once you have joined the list, the pages will appear for download. If you are already a member of our mailing list, this form will confirm your details. You will not be added to any additional list.